Being aware that very poor Least Developed Countries would distort any observable anticorrelation, I did another experiment without the Least Developed Countries, but Least Developed Countries actually had less effect on the result than I expected. Their absence did make the slightly positive Pearson correlation of +0.09 marginally negative at -0.04. However, if we study the graph above closely, one does see nothing in the far upper right (high actual and high parity emissions), but quite a few countries in the far upper left (high actual and low ecological parity emissions). This does suggest that in the Enriched World there exist inherent political or resource limitations to the growth of per capita greenhouse emissions that are absent from the arid subtropics of the Eastern Hemisphere or from the humid tropics (e.g. Årts and Janssen, 2006). If I had done a study with only high-income countries, I imagine a definite anticorrelation would be seen. Such an anticorrelation is wholly untenable and ignorance thereof a significant problem. In my previous post, I demonstrated the the Kyōtō Protocol of 1996 almost entirely targeted countries of limited significance, and whose ecology (Lovegrove, 2000) does not dictate low energy consumption. 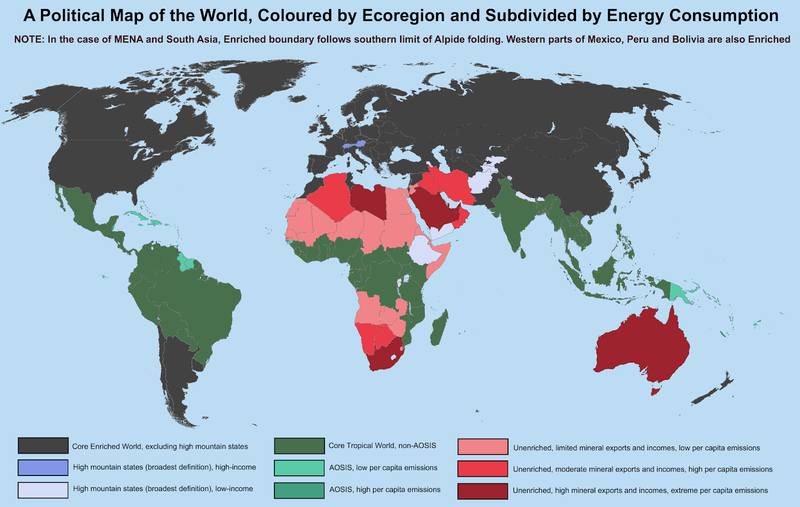 The Enriched World, where every “Annex 1” country bar Australia was located, constituted the ecological bloc least required to lower emissions for ecological parity (Koch, 2003, p. 147; Najam et. al, 2003). Thus, the countries set emissions targets were – with the paramount exception of Australia – the very countries with least requirement therefor. 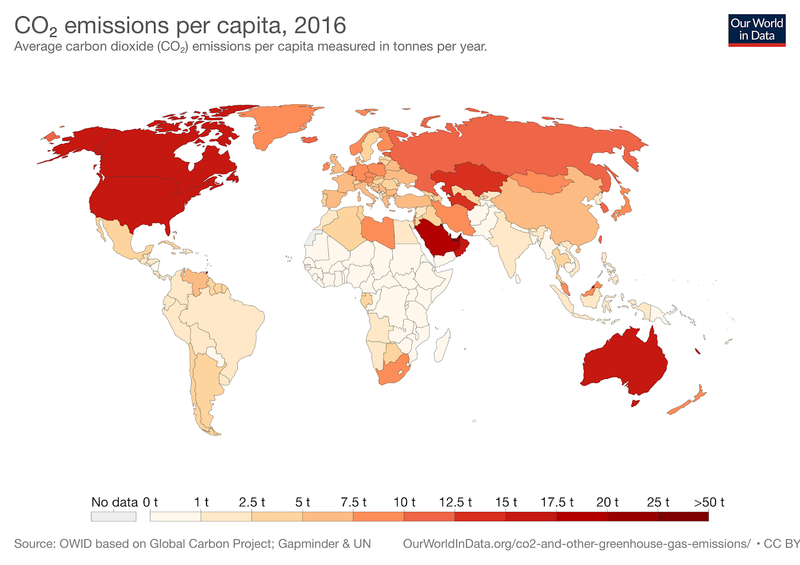 If we combine these countries with China, which borders this region on its southwest flank, we create a continuous bloc of seven countries accounting for over forty percent of total global emissions. On this ground, targeting this bloc for punitive emissions reductions (demonstrably necessary for Australia and Gulf oil states) would have appeared desirable. However, the economic disadvantages of their cool climates, plus their low ecological fragility (Huston and Wolverton, 2009) and their void in bauxite deposits, mitigate against severe relative targets for even the worst Enriched polluters. Moreover, historical climate politics demonstrates the likelihood or the United States and Canada siding with Australia rather than lower-emissions Enriched nations (Flannery, 2007). New Zealand, Russia, and the former Soviet satellites behaved similarly. Consequently, I have made a 20% allowance above parity targets for all nations in the sub-bloc. 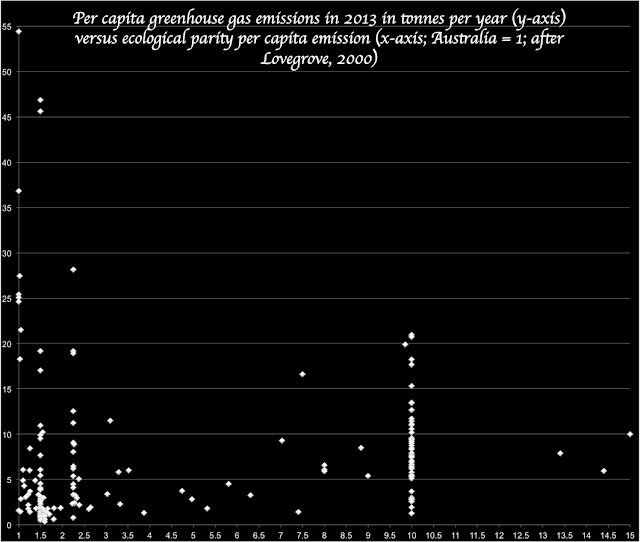 Essential emissions cuts by Australia and the Gulf States would mandate large efficiency improvements elsewhere, which would have reduced this elevated-emissions Enriched sub-bloc’s emissions beyond the targets listed below. Russia 0.51 -25% ±0% — Second largest coal reserves in world. Suspicions that after-effects of the Kyōtō Protocol have been a major factor in the United States’ growing partisan political divide has led me to propose a substantial allowance for that nation. This allowance has the virtue of simplifying matters for the sub-bloc as a group. Overall, these proposed direct reductions in the elevated-emissions sub-bloc would triple those from the much severer reductions ecologically demanded from the oil exporters and Australia (see previous post), totalling 14 percent of global emissions. Unlike the radical infrastructure projects that were ecologically essential in Australia and oil states, reductions in these nations would have merely required improvements in efficiency from nations that for the most part were already wealthy, such as improved fuel efficiency technology in American and Russian road vehicles and homes, and altered product cycles for consumer goods to deal with the reduced supply of metals from Australia. In a recently-updated post from over three years ago, I pointed out that the Kyōtō Protocol failed because it was formed from alliances of nations with diametrically opposed interests regarding regulation of man-made greenhouse gas emissions. As Mickey (2015) has demonstrated, a disorganised politics favours the “haves” over the “have-nots”. During the the Kyōtō Protocol, disorganisation of international alliances permitted the fossil fuel “haves” – Australia and the Gulf States with already the world’s highest per capita emissions – carte blanche to increase their emissions. A properly organised system of alliances would have seen these wealthy resource-exporting nations outnumbered and under fierce pressure from LDCs, SISs, high mountain states and the high-technology industrial nations for deep and rapid emissions reductions. As things stood, two greenhouse sceptic organisations – The Climate Council and Global Climate Coalition (Oberthür and Ott, 1999, page 45) – were able to control OPEC’s delegations and “miss few opportunities to slow down progress towards taking common action in international negotiations” (Oberthür and Ott, 1999, page 26). The oil exporters also (Årts and Janssen, 2003) developed a tight partnership with US fossil fuel businesses that effected elimination of any quantified emissions targers for these exceedingly high per-capita polluters. In contrast the LDCs, SISs and the EU – the resource-poor pro-reduction countries – placed themselves in disparate blocs and failed to develop a plan to counter the OPEC nations, nor the analogous Australian greenhouse sceptic organisations who dictated policy there. Luomi (2011) has demonstrated how the LDCs – at least Muslim LDCs – were led and had their interests represented by oil states with opposing interests rather than the by EU with aligned interests. The above table – although exceedingly crude and not accounting for large variations in every multi-nation ecoregion – does demonstrates why achieving deep and rapid reductions in Australian and Gulf States emissions constituted Kyōtō’s urgent task. 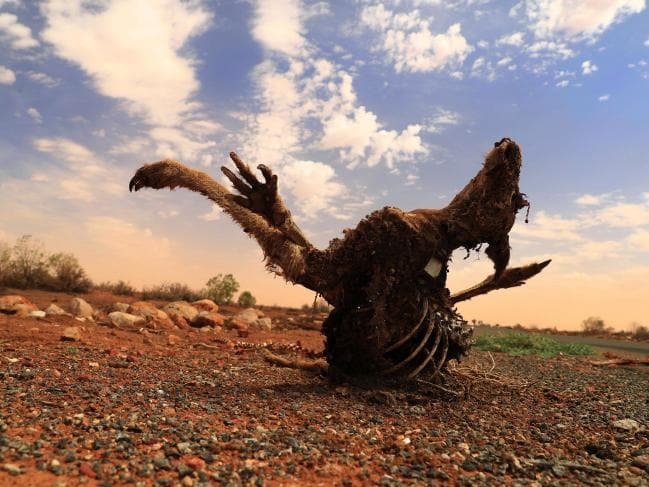 The Protocol failed completely, and at great cost judging by the certainty of 2019 annual rainfalls in southern Australia of less than one quarter previous record lows. 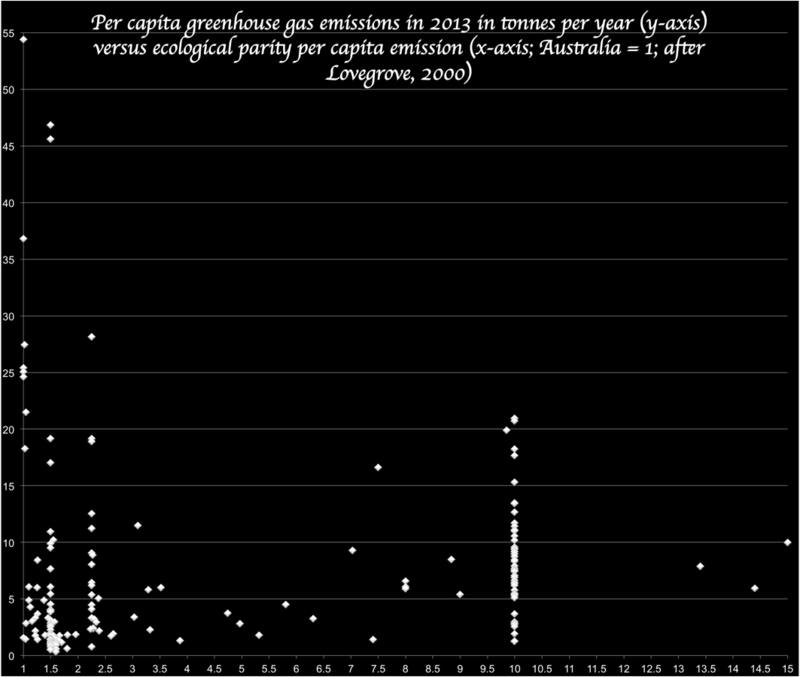 Australia -98% +8% — Lowest allowable per capita emissions due to unique ecology. With this plan, the EU, LDCs, small-island and high mountain countries would have needed to make rigid demands on Australia, the Gulf States, and to a lesser extent South Africa. Undoubtedly, this would have involved greater sacrifices for all parties than the hopeless Protocol actually achieved, but vast emissions reductions by the wealthiest resource exporters – whose native ecology (Flannery 1994, Lovegrove 2000, Orians and Milewski 2007) dictates they be world leaders in climate action rather than laggards (Thwaites, 2018) – would have large flow-on effects (Lafleur 2020, in publication). Targets outlined above would have directly cut global emissions by no more than the targets of the actual Kyōtō Protocol. However, loss of fossil fuel and lithophile metal sources would have necessitated much more efficient use and reuse of these commodities by the big manufacturing nations. One would expect this improved efficiency to multiply reductions far beyond actual Kyōtō targets. Had a substantial proportion of the direct and indirect cuts proposed above been achieved by 2010, southern Australia and Central Chile would not be facing runaway drying with loss of over 90 percent of their virgin rainfall. Mickey, Robert (2015); Paths Out of Dixie: The Democratization of Authoritarian Enclaves in America's Deep South, 1944-1972, Princeton, New Jersey: Princeton University Press. The lag between tropical expansion and rainfall shifts – is it to disappear? An asterisk (*) indicates that the record low rainfall occurred before 1974. MJJA (May-June-July-August) refers to the May to August period that constitutes the rainy season in Southwest Western Australia and Central Chile. As we can see, the annual rainfall one would expect from a 7.5˚ poleward shift in all climate belts remains less than the driest observed year for all selected stations except Horsham Polkemmet Road (BOM 079023). Even there the driest observed year – 1982 – is only a few millimetres drier than the estimated mean. In addition, the stations used to model Wimmera rainfall under a 7.5˚ poleward shift in climate belts suggest it likely that the median would be under 181 millimetres even with a mean of 185 millimetres. One major problem is that Central Chile rainfall was historically limited much more by unfavourable land-ocean temperature gradients than by the descending limb of the Hadley Cell. The dryness of the El Niño years of 2014, 2015, and 2018 suggest, however, that such is emphatically not the case beyond the 2010 “magic gate”. The implication is that current ongoing expansion of the Hadley Cell sets a rigid ceiling upon Central Chile rainfall in a manner absent even during the 2000s, when Santiago exceeded its maximum 2010s MJJA rainfall of 209.9 millimetres in four non-El Niño years (2000, 2001, 2005 and 2008). Another problem is that the topography and coastal shape 7.5˚ closer to the equator differ from those surrounding the stations listed, although I was careful to choose those stations least likely to be controlled by differences of this type. 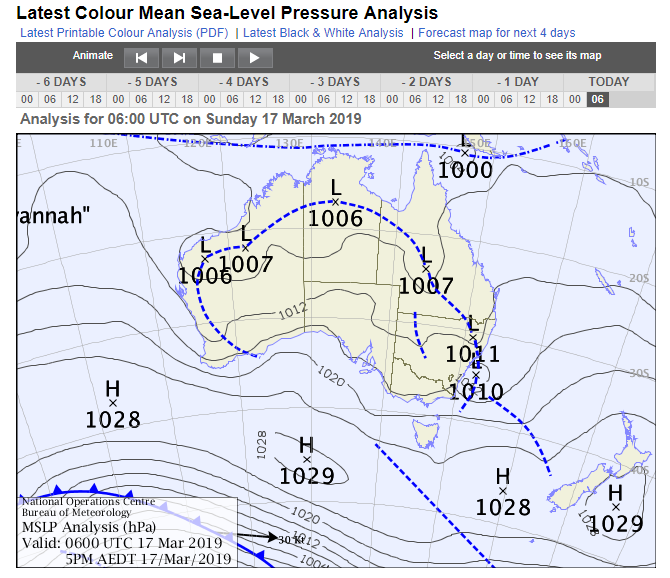 What is revealing about the last three months – in which Melbourne has seen only 33 millimetres with little hope for more in the foreseeable future – is that the subtropical anticyclone has been located as far south as 48˚S (see synoptic map at top). If we combine the subtropical anticyclone’s historic summer position and the known expansion of the Hadley Cell since the 1950s, 48 degrees South is almost precisely where we would expect the summer subtropical anticyclone to be today. This has suggested to me that we will be observing a “catch up” of rainfall belts with the observed shifts of the Hadley Cell since the 1950s (Seidel et. al, 2008, Liu et. al, 2012, plus personal communication). Should this be correct, rainfalls in Southwest Western Australia, southeastern Australia and Central Chile will, beginning this year, show dramatic declines below 2010s averages. These 2010s averages are already 30 percent below virgin averages before man-made greenhouse emissions expanded the Hadley Cell, and 50 percent less in the Santiago region. Given widespread predictions of another record El Niño in 2019, annual rainfalls in southern Australia of one-half or even one-quarter existing record lows appear even at this early stage a probable outcome if we study the above tables. Even if positive Indian Ocean Dipole and negative Southern Oscillations are less persistent than some models (e.g. Chie et. al. 2008) suggest, there is still a likelihood that the frontal rain belt will be wholly shifted beyond any part of mainland Australia by the “catch up” noted in the previous paragraph. The implications for public and private farming policy of a 7.5˚ or larger shift in annual rainfalls are stark. The winter rain belt would become wholly extinct, and with it rainfed winter grain crops – a complete 2019/2020 crop failure throughout southern Australia already appears plausible. Irrigated crops would also likely disappear. The rainfall declines modelled at the beginning of this article would certainly mean zero median annual runoff (Chiew et. al. 2006) for every river in Australia’s historic winter rainfall zone. What governments would do confronted with this situation and powerful agribusinesses demanding bailouts from certain severe financial losses is not worth imagining. Expensive schemes to redirect runoff from other parts of Australia, or desalination and pipelines, would create still more disastrous after-effects in greenhouse gas emissions and disturbance to sensitive and unique river ecologies. Nonetheless, I still think it plausible that agribusiness possesses sufficient power to gain such bailouts, tragic as they would be not only for Australia’s ecology but for the remainder of the globe. It would even speak ill of Australia if it were to abandon farming because of catastrophic climate change rather than as a result of recognising it as inherently unsustainable on our uniquely ancient soils. for Collie (009628) and Manjimup (009573) the estimated rainfall under a 7.5˚ poleward shift was increased by 10 percent to account for the Darling Scarp orographic effect. As recent weeks clearly reveal a tipping point in Australia’s climate – with only 33 millimetres of rain in three months in Melbourne and none forecast for the next week – the revelation that the Murray-Darling Basin is drying out is not unexpected but shocking nonetheless. Jed Smith of vice.com and Maryanne Slattery of The Australia Institute have demonstrated in their recent article ‘“These weren’t mistakes”: “Dodgy” policies to blame for Murray Darling’s downfall’ that an Australian National University study demonstrating that vastly less water had been returned to the river system than claimed by the government. Maryanne also revealed large-scale water theft by the factory-scale irrigators in the basin’s upper reaches, who grow the water-intensive crops of rice, tobacco and cotton on a landmass whose rivers lack baseflow during below-average or even average rainfall. Water that in other continents creates baseflow is in Australia absorbed by dense proteoid root systems necessary to absorb scarce nutrients. In other extant continents these nutrients have been enriched by orders of magnitude via mountain building and aeolian glacial tills. There, lower rooting densities and much smaller threshold rainfalls to activate runoff are not only possible but essential. What they show a a requisite is that irrigators – politically powerful due to their unrivalled profits on Australia’s abundant land in wet years – to be absolutely forbidden from extracting purchased water. What has actually happened is irrigators simply buying the water purchased by government, eliminating supposed additional flows. These flows are required to preserve ecosystems 13,000 times more ancient and comparably more specialised that the typical 10,000-year-old ecosystem of Europe, North America or New Zealand. Australian aquatic flora and fauna are adapted to flows three times more variable than those of Europe, North America, New Zealand, East Asia or South America, and lose out when flows are modified to fit farming practices tested in the fleetingly young Enriched World. In fact, as Mary E. White showed in Running Down: Water in a Changing Land, the entire Murray-Darling and Lake Eyre Basins – and indeed most of the higher Western Plateau – constitutes one ephemeral floodplain adapted to extremely irregular floods. This is utterly different not only from the fast-flowing streams in U-shaped valleys of most of the Enriched World, but even from the permanent slow-flowing streams of the Amazon Basin or the bayou country of the Southern United States. In almost all of Australia, runoff occurs only ephemerally following abnormal rainfall, and when rivers do flow, they can cover the whole land area – as in the famous 1990 floods when Nyngan was completely evacuated. Such environments are simply not designed for annual crops. In the natural state of the MDB, such crops would fail in the vast majority of years, and reservoirs six times those of Europe, North America or New Zealand are needed to maintain the same reliability of supply even ignoring higher evaporation. Instead of “getting big”, Australia needs a plan for its farmers to get out – and get out as soon as possible. A “get out” plan would involve restoring the rivers of inland Australia to their naturally uniquely variable flows and specially adapted endemic species, and restoring farmland to native flora. This plan was proposed on a smaller scale for uneconomic less large farms two decades ago by Tyrone Thomas in his My Environmental Exposé, but contradicts a free market that locates agriculture where land is cheapest. However, where land is cheapest is precisely where farming does by far the greatest ecological harm. This is why a large-scale, long-term plan to take control of Australia’s rivers from Australian and foreign agribusinesses, and return our climatically vulnerable rainfed farmland to specially adapted native flora and fauna, is one of the most critical steps for reversing the ecological crisis. Benefits of mass revegetation will accrue not only to Australia but globally in terms of reduced greenhouse gas emissions and increased economic profitability on other continents incomparably better suited to agriculture.